I AM. So it is that this post begins with the dictates of the RUACH, placing the I AM in bold by its own impetus, so I will leave it. I undertake this discussion, therefore, with all reverence of the divine name and its meaning, and pray that this discussion will bless you in every way. Baruch atah יהוה ELOHAYNU melek ha’olam. Let us make no bones here – it was YAHUAH ELOHIYM who created the earth and the heavens. But the word ELOHIYM is a plural – a masculine plural. How can this be understood? The name יהוה is comprised of four Hebrew letters: yod; heh; vav; heh. Let us discuss these in a different sense for a moment. The word for hand in Hebrew is yad, spelled יד which is the same spelling as the word yod, which is the word for the letter י. Shall we conclude, then, that the yod in the tetragrammaton can have the meaning the hand; i.e., the hand of _____. Why is nothing said here? Because the infinite YAH cannot be bounded, described, or even named – a consuming fire who occupies an infinite number of dimensions infinitely. In the study of the mysteries, the description ayn soph (without end) is used. I will use this phrase, although I am not committed to this description as a proper noun. But we must have something be which can communicate the concept. The yod therefore is the hand of the ayn soph, or the workmanship of the ayn soph. In accord with the function of the Hebrew, we see the yod working in the infinite to create the discrete we call creation; and we see the yod working in the finite to forever restore the discrete to the eternal, or in the Hebrew tikkun olam. All of this is discussed is the Hebrew letter aleph, where the yod in the infinite is divided from its reflection in the finite by the vav – the nail. Vay’amar ELOHIYM el Mosheh AHYAH ASHER AHYAH (אהיה אשר אהיה). In this phrase, you see that all three of the words used begin with this very same aleph. If we consider that the aleph is the first, and means the first, the chief, the principal, then we find that this word AHYAH is construed as I AM, but can also mean Behold! The Hand!, yet the hand – the yod, is between two hehs and is preceded by the aleph. For purposes of this discussion, let us assume that the heh means the breath of YAH, the actual breath of the RUACH, the word which means the very breath of YAH. The heh was introduced to Avram when he was anointed under the covenant to become Avraham. The he was introduced to Sarai when she became the mother of the covenant as Sarah. Let us then assume with some confidence that the heh is the very breath of the RUACH. Now, this name AHYAH is the hand of YAH surrounded by the breath of YAH to the left and to the right and is preceded by the ALEPH; i.e., HAMASHIACH. Let us now compare with the tetragrammaton. Here, the hand of YAH (the yod/yad) precedes, and we find the vav – the nail – surrounded by two hehs. 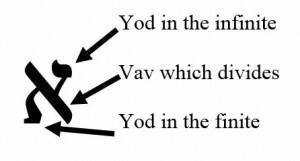 The vav is found with the breath of YAH to the left of it and to the right of it, and is preceded by the yod – YAH. Consider the implications when you understand the vav – the nail – as our crucified MASHIACH. Yod-Heh-Vav-Heh: The handiwork of the ayn soph, and MASHIACH surrounded by the breath of the RUACH. Hear, O Yisra’el; YAHUAH ELOHAYNU YAHUAH is one: 30 And you shall love YAHUAH ELOHAYCHA with all your heart, and with all your soul, and with all your mind, and with all your strength: this is the first commandment. 31 And the second is like, namely this: You shall love your neighbor as yourself. There is none other commandment greater than these.